Indonesia's Bali volcano of Mount Agung spewed thick smoke and ashes billowing 2.5 kilometer into the air on Sunday morning, following similar event that occurred on Saturday at almost the same time. 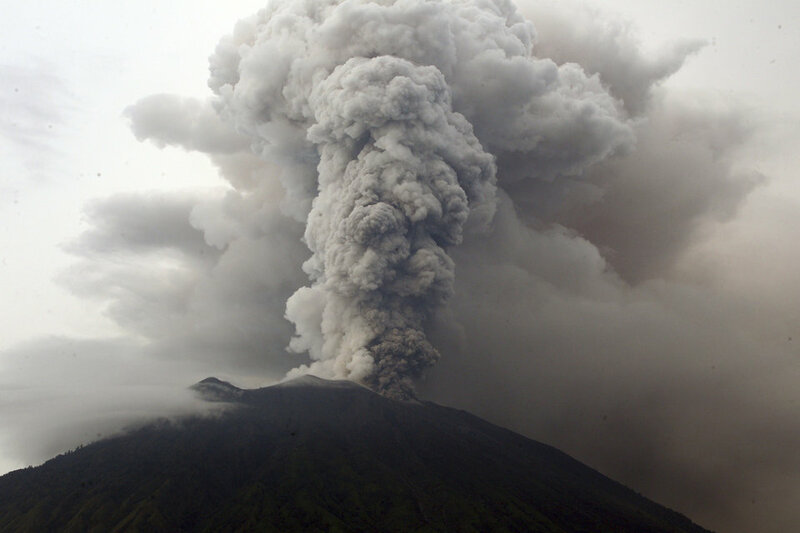 The Sunday's eruption took place at 10:05 a.m. local time, emitting grayish thick smoke with wind detected heading for northeast, Indonesian National Disaster Mitigation Agency (BNPB) said. "The eruption lasted for 10 minutes. White smoke was seen came out from the volcano summit after the blast," BNPB Spokesperson Sutopo Purwo Nugroho said in a statement on Sunday. "Daily activities were normal in Bali, people remained calm. They currently have enough knowledge on impacts from the volcano's eruption," Sutopo added. "Outside those areas were still normal and safe," he said. Volcanic activities of Mount Agung have been ensuing since September after 54 years of inactivity. The volcanic event has severely battered Bali's tourism since then.